The average backyard may be visited regularly by 15 to 20 different bird species. However, a bird-friendly yard can attract up to 60 or more different species. Wild Birds Unlimited is dedicated to offering fresh, top-quality seed. 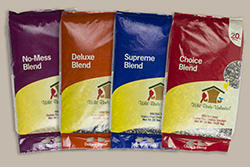 Our no-waste bird seed blends are made from 100% edible seed. No cereal fillers—just fresh, high-quality seed your birds will love. Birds, such as woodpeckers, chickadees and nuthatches, will readily come to suet for its high-fat, high-energy content. 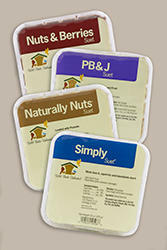 We offer a variety of suet flavors to help you attract a wider variety of birds. All Wild Birds Unlimited suet is rendered, meaning impurities that can cause spoilage are removed. Nyjer attracts finches of all kinds. Its high-oil content is an excellent energy source for active birds and is best used in our specially-designed finch feeders. It is important to keep the food fresh for our picky little eaters. Once seed starts to dry out and become stale, finches will turn up their beaks for fresher forage. Store your Nyjer in an airtight container for a longer shelf life and buy in quantities that will be used up in a few weeks.